, commonly called Regiomontanus, from his native place, Mons Regius, or Koningsberg, a town in Franconia, was born in 1436, and became the greatest astronomer and mathematician of his time. He was indeed a very prodigy for genius and learning. 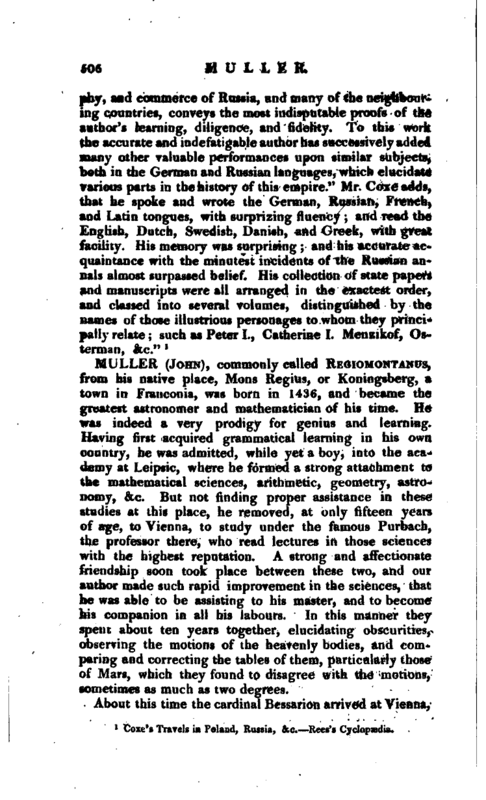 Having first acquired grammatical learning in his own country, he was admitted, while yet a boy, into the academy at Leipsic, where he formed a strong attachment to the mathematical sciences, arithmetic, geometry, astronomy, &c. But not finding proper assistance in these studies at this place, he removed, at only fifteen years of age, to Vienna, to study under the famous Purbacb, the professor there, who read lectures in those sciences with the highest reputation. A strong and affectionate friendship soon took place between these two, and our author made such rapid improvement in the sciences, that he was able to be assisting to his master, and to become his companion in all his labours. In this manner they spent about ten years together, elucidating obscurities, observing the motions of the heavenly bodies, and comparing and correcting the tables of them, particularly those of Mars, which they found to disagree with the motions, sometimes as much as two degrees. About this time the cardinal Bessarion arrived at Vienna, | to negociate some affairs for the pope, and being a lover of astronomy, soon formed an acquaintance with Purbich and Regiomontanus. 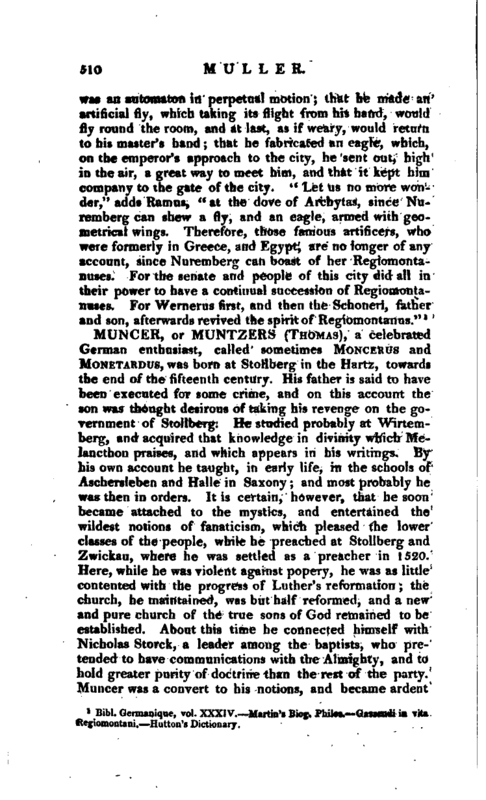 He had begun to form a Latin version of Ptolomy’s Almagest, or an Epitome of it; but not having time to go on with it himself, he requested Purbach to complete the work, and for that purpose to return with him into Italy, to make himself master of the Greek tongue, which he was as yet unacquainted with. To these proposals Purbach only assented, on condition that Regiomontanus would accompany him, and share in all the labours, which were, however, soon interrupted by the death of Purbach, which happened in 1461. 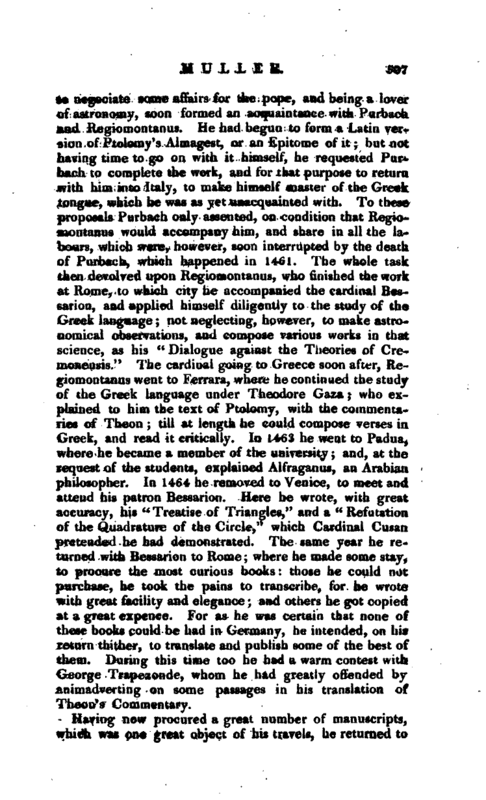 The whole task then devolved upon Regiomontanus, who finished the work at Rome, to which city he accompanied the cardinal Bessarion, and applied himself diligently to the study of the Greek language; not neglecting, however, to make astronomical observations, and compose various works in that science, as his <f Dialogue against the Theories of Cremonensis.“The cardinal going to Greece soon after, Regiomontanus went to Ferrara, where he continued the study of the Greek language under Theodore Gaza; who explained to him the text of Ptolomy, with the commentaries of Theon; till at length he could compose verses in Greek, and read it critically. In 1463 he went to Padua, where he became a member of the university; and, at the request of the students, explained Alfraganus, an Arabian philosopher. In 1464 he removed to Venice, to meet and attend his patron Bessarion. Here he wrote, with great accuracy, his” Treatise of Triangles,“and a” Refutation of the Quadrature of the Circle," which Cardinal Cusan pretended he had demonstrated. The same year he returned with Bessarion to Rome where he made some stay, to procure the most curious books those he could not purchase, he took the pains to transcribe, for he wrote with great facility and elegance; and others he got copied at a great expence. For as he was certain that none of these books could be had in Germany, he intended, on his return thither, to translate and publish some of the best of them. During this time too he had a warm contest with George Trapezonde, whom he had greatly offended by animadverting on some passages in his translation of Theon’s Commentary. Having now procured a great number of manuscripts, which was one great object of his travels, he returned to | Vienna, and for some time read lectures; after which he went to Buda, on the invitation of Matthias king of Hungary, who was a patron of learned men, and had founded a rich and noble library there, from the purchase of the Greek books found on the sacking of Constantinople, and others brought from Athens, or wherever else they could be met with through the whole Turkish dominions. But a war breaking out in this country, he retired to Nuremberg, which he preferred, because the artists there were dextrous in fabricating his astronomical machines, and he could from thence easily transmit his letters by the merchants into foreign countries. Being now well versed in all parts of learning, and made the utmost proficiency in mathematics, he determined to occupy himself in publishing the best of the ancient authors, as well as his own lucubrations. For this purpose he set up a printing-house, and formed a nomenclature of the books he intended to publish, which still remains. Here Bernard Walther, one of the principal citizens, who was well skilled in the sciences, especially astronomy, cultivated an intimacy with Regiomontanus; and as soon as he understood those laudable designs of his, he took upon himself the expence of constructing the astronomical instruments, and of erecting a printing-house. 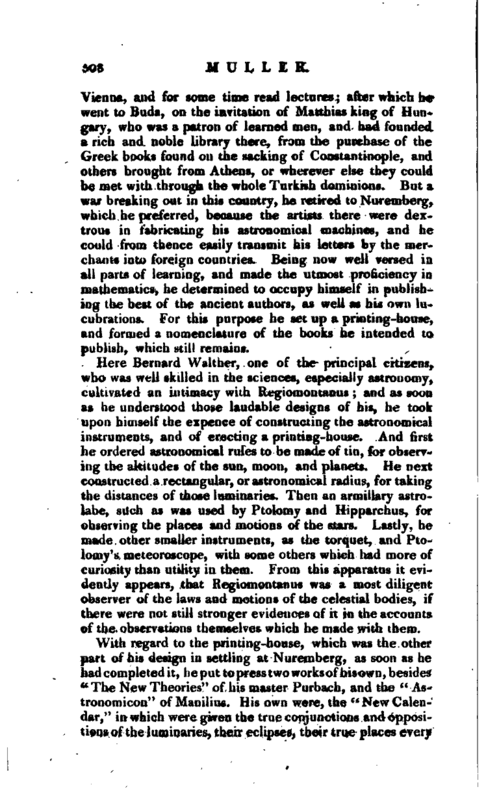 And first he ordered astronomical rules to be made of tin, for observing the altitudes of the sun, moon, and planets. He next constructed a rectangular, or astronomical radius, for taking the distances of those luminaries. Then an armillary astrolabe, such as was used by Ptolomy and Hipparchus, for observing the places and motions of the stars. Lastly, he made other smaller instruments, as the torquet, and Ptolomy’s meteoroscope, with some others which had more of curiosity than utility in them. From this apparatus it evidently appears, that Regiomontanus was a most diligent observer of the laws and motions of the celestial bodies, if there were not still stronger evidences of it in the accounts of the observations themselves which he made with them. With regard to the printing-house, which was the other part of his design in settling at Nuremberg, as soon as he hadcompletedit, he put to press two works of his own, besides “The New Theories” of his master Purbach, and the “Astronomicon” of Manilius. His own were, the “New Calendar,” in which were given the true conjunctions and oppositions of the luminaries, their eclipses, their true places every | day, &c. His other work was his “Epbemerides,” of which he thus speaks in the said index “The Ephemerides, which they vulgarly call an Almanac, for 30 years where you may every day see the true motion of all the planets, of the moon’s nodes, with the aspects of the moon to the sun and planets, the eclipses of the luminaries; and in the fronts of the pages are marked the latitudes.” He published also most acute commentaries on Ptolomy’s Almagest: a work which cardinal Bessarion so highly valued, that he scrupled not to esteem it worth a whole province. He prepared also new versions of Ptolomy’s Cosmography and at his leisure hours examined and explained works of another nature. He inquired how high the vapours are carried above the earth,which he fixed to be not more than 12 German miles; and set down observations of two comets that appeared in 1471 and 1472. In 1474, pope Sixtus the 4th conceived a design of reforming the calendar; and sent for Regiomontanus to Rome, as the most proper person to accomplish his purpose, who, although much engaged in his studies, and printing, at length consented to go. He arrived at Rome in 1475, but died there the year after, at only forty years of age; not without a suspicion of being poisoned by the sons of George Trapezonde, or Trapezuntius, whose father is said to have been killed by the criticisms of Regiomontanus on his translation of Ptolomy’s Almagest. Purbach was the first who reduced the trigonometrical table of sines, from the old sexagesimal division of the radius, to the decimal scale; but Regiomontanus brought this to a much greater degree of perfection. 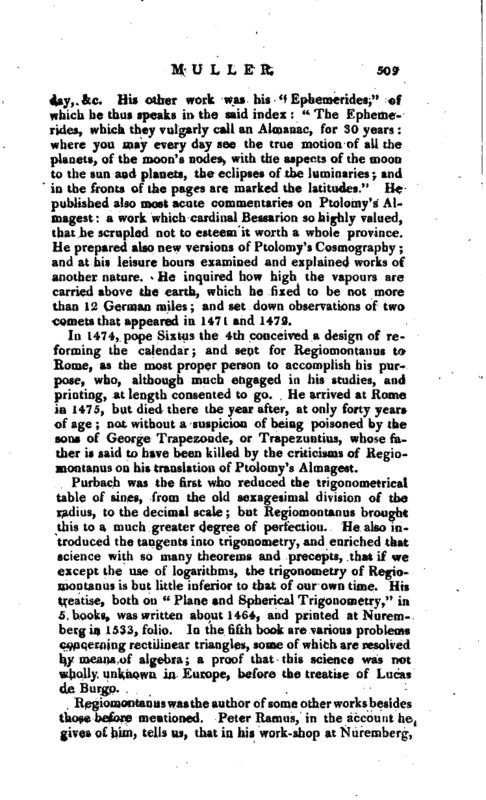 He also introduced the tangents into trigonometry, and enriched that science with so many theorems and precepts, that if we except the use of logarithms, the trigonometry of Regiomontanus is but little inferior to that of our own time. His treatise, both on “Plane and Spherical Trigonometry,” in 5 books, was written about 1464, and printed at Nuremberg in 1533, folio. In the fifth book are various problems concerning rectilinear triangles, some of which are resolved by means of algebra; a proof that this science was not wholly unknown in Europe, before the treatise of Lucas de Burgo. Bibl. Germanique, vol. XXXIV. Martin’s Biog. Philos. Gassendi in vita Regiomontani. —Hutton’s Dictionary.